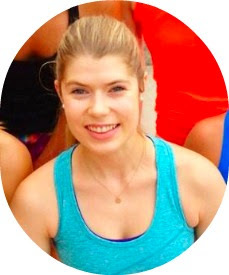 Last week, I impulsively signed up for Laura @ Mommy RunFast’s sugar detox. I signed up for the challenge, without much thought or preparation, because while I go through periods where I don’t really want sugar very much, I also go through some insane sugar cravings. And if I think about a certain sugary item, then I immediately want it. Monday and Tuesday both went relatively well, except for a few swallows of kombucha and a bite of Kim’s birthday dessert at her surprise dinner Monday night. 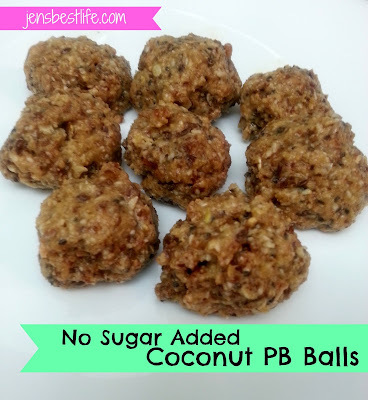 But Wednesday morning I was absolutely dying for some sugar, so I made these coconut peanut butter balls using dates to add sweetness. They remind me of something my mom used to make when I was little and they're a great sweet snack without a hit of refined sugar. 1. Add all ingredients to food processor and blend until it sticks together. 2. Form mix into balls and refrigerate for 30 minutes. Have you ever done a sugar detox or other kind of cleanse? Yum, those look good! I try not to eat too much refined sugar, but I can never say no to fruit. Apples, bananas, frozen grapes (obviously! ), I love it all. Useful to have a snack like this handy when you fancy something sweet. I would prefer to use almond butter or another nut butter as commercial peanut butter can be contaminated with the toxic mould aflatoxin.